Kyle Meyer, left, and his mother, Joanne Meyer, pose outside their restaurant and bar at 14 S. Sandusky St. in downtown Delaware. The bar celebrates 35 years of being known as the Backstretch. Taylor Clark shows a mug with the original logo of the Backstretch. Clark’s late grandfather, Steve Millisor, gave the bar its current name. Joanne Meyer and her son Kyle have rebranded their iconic downtown Delaware bar for the 21st century. While the new logo and website emphasize the business’s food side, the 14 S. Sandusky St. establishment marks about 35 years of being known as The Backstretch, or its nickname the Stretch, following multiple name changes since the 1940s. “It was like wow, I can’t believe it’s been that long,” Joanne Meyer said. The venue was once used as part of a grocery store in the early 1900s, according to the Backstretch’s website. The building was known as Bianchi’s Bar & Grill up until 1946. Then Buttsy’s Bar & Grill replaced it and was later succeeded by Holly’s Place in the 1970s and Jack’s Place in 1980. The Backstretch name arrived in 1982 when the now late Steve Millisor took ownership of the bar. Millisor got the name from his favorite place to watch the Little Brown Jug horse race in September each year. “He had a permanent spot on the backstretch,” said Taylor Clark, Millisor’s granddaughter who now works full time at the bar. The backstretch is located on the opposite side of the grandstand of race tracks. 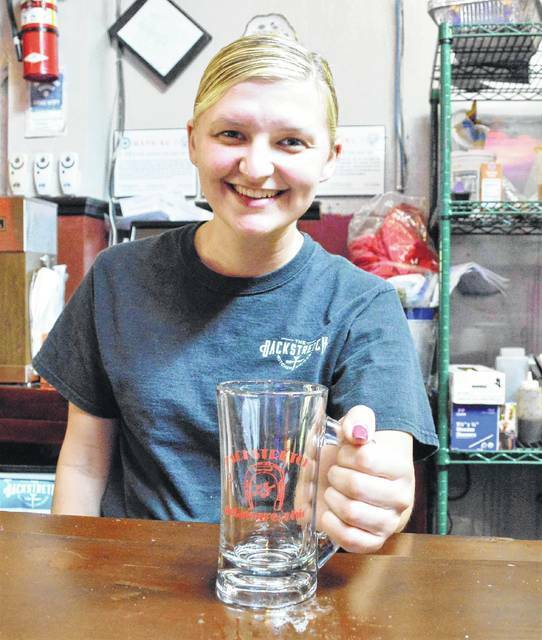 Clark is part of the fourth generation in her family to work at the bar. She often encounters customers who bring up her family’s connection with the bar. “I have a lot of people that come in and look at me and figure out who I am without me telling them,” she said. Jeff Meyer, Joanne’s late husband, became the next owner of the bar in 1990. They thought about changing the name at the time. Under the Meyers’ ownership, the bar has seen some structural changes including the extension of the building’s rear side and updates for utilities. After Jeff Meyer died in 1999, their son Kyle became more involved in the family business. They installed a kitchen in 2014 to serve food. “I think the name staying the same would be very important because it was a staple. It’s always been a staple in all of our lives,” Clark said. Joanne and Kyle Meyer said some customers have gradually accepted the changes over the last few years. And the venue continues to be a place where everyone is welcome, she added. https://www.delgazette.com/wp-content/uploads/sites/40/2017/07/web1_DSC_0010.jpgKyle Meyer, left, and his mother, Joanne Meyer, pose outside their restaurant and bar at 14 S. Sandusky St. in downtown Delaware. 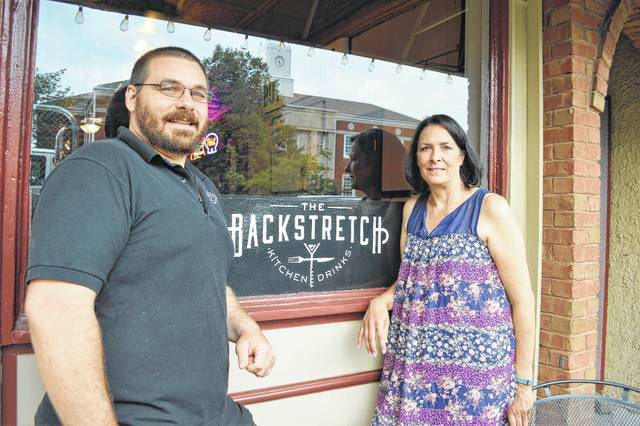 The bar celebrates 35 years of being known as the Backstretch. https://www.delgazette.com/wp-content/uploads/sites/40/2017/07/web1_DSC_0022.jpgTaylor Clark shows a mug with the original logo of the Backstretch. Clark’s late grandfather, Steve Millisor, gave the bar its current name.